The Niles Auriel, Niles Audio MRC-6430, is a whole home audio controller that integrates with automated lighting and thermostats. 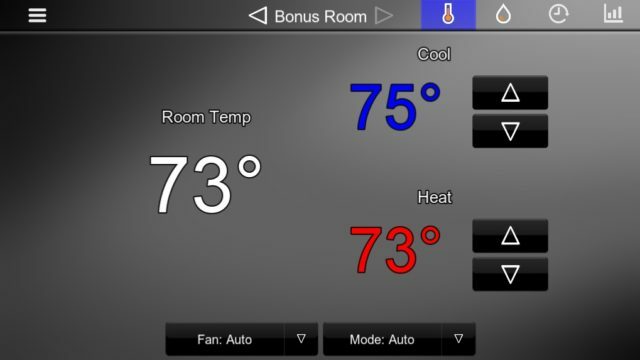 It is a DIY home automation solution that fits the niche of home a/v enthusiasts that want to program their own systems, but still want an elegant two-way interface with nTP7 touchpanels, remote controls, and Apple/Android app. At an MSRP of $2,099 it offers the functionality of of a fully baked automation system while powering up to six audio zones including one with a home theater receiver. Remember that myEasytek is your one stop shop for sales, support, and even programming assistance for all of your home a/v and automation equipment, including the Niles Auriel. Be sure to send us an email asking about promotions, design questions, and feedback. A single Niles Auriel can independently control 6 zones of audio. It has a built in 8-channel amplifier that can power up to 4 zones. At an 8 ohm load it outputs 30W per channel. At a 4 ohm load, it outputs 60W to each channel. The fact that it’s 4 ohm stable means that up to 16 speakers can be connected to the Niles Auriel without the need for any impedance matching devices or external amplification. Each of the powered zones also has a preamp output so that external amps can be connected in lieu of or in tandem with the powered output. The remaining two zones (5 and 6) only have preamp outputs. This is for the connection of external amplifiers or home theater receivers. If you have a home theater with a powered Zone 2 output you can connect it to both preamp outputs to power all zones with no additional equipment necessary. The Niles Auriel has 6 analog source inputs that can be played to the 6 zone outputs in any combination. Each source input has a looped output so that multiple Niles Auriel units can be connected and used in tandem to make a 6×12 audio solution. These analog source inputs can be used for cable boxes, tv outputs, and even supported media servers such as a Sonos Connect or Mirage MMS-2A. Source input levels are full adjustable so that the output level can be equal between different pieces of equipment. 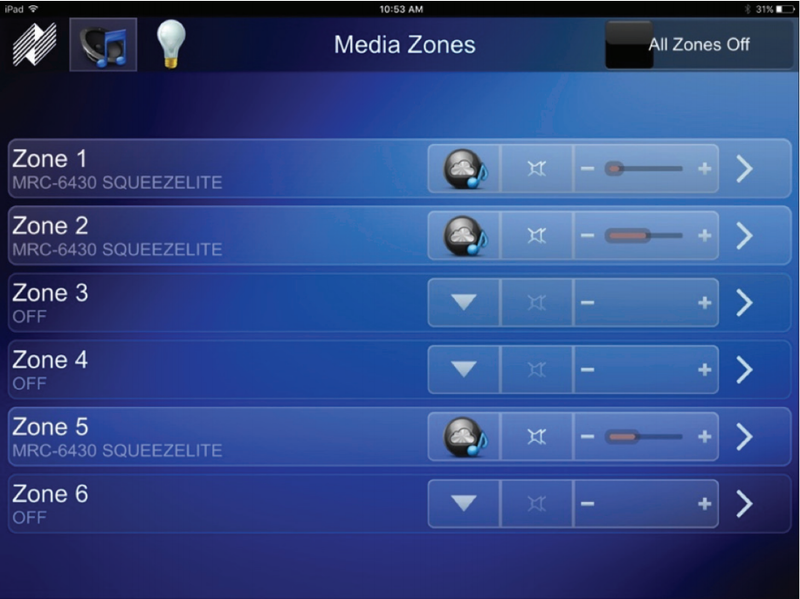 The Niles Auriel supports one zone that uses a surround sound receiver, which is referred to as the “Home Theater Zone”. It has 6 available IR outputs that are assignable to the equipment in the Home Theater Zone, such as cable boxes, Bluray players, and the TV. 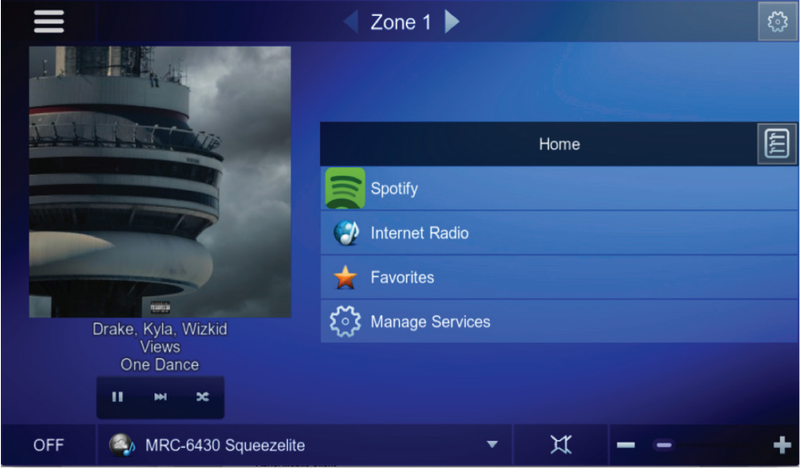 All of the audio and video equipment in this zone can be controlled by the nTP7 touchpanels or the Apple/Android app. This zone can also use the nHR200 remote control. The remote is a handheld with all of the tactile buttons you could expect, plus a touchscreen LCD for soft buttons and two-way feedback for source control and volume. Below is a demonstration of the gHR200 remote control, which is identical to the nHR200 that is purchased with the Niles Auriel. The end of the demonstration even includes shade control, of which the Niles Auriel is also capable. The Niles Auriel has an internal Logitech Media Server. It requires an account at mysqueezebox.com and currently supports Pandora, SiriusXM, Spotify, TuneIN, Tidal, and Deezer. A Pandora One or Spotify Premium account is needed to utilize those respective services. 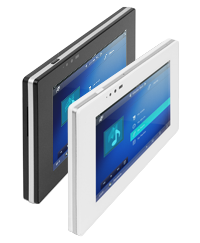 The Niles Auriel also supports external media servers with two-way control from nTP7 touchpanels and the Apple/Android app. 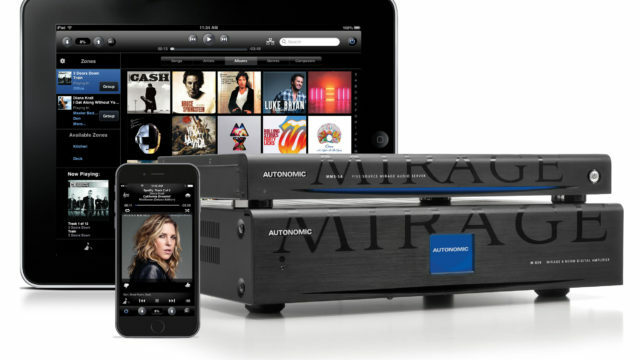 Compatible media servers include Sonos Connect, Fusion Ovation, or Mirage MMS-2A/MMS-5A. Not all services are supported, but the most common such as Pandora, SiriusXM, Spotify, usually are. Below is an image of the internal LMS using Spotify. With the release of the 2.0.75 firmware update, the Niles Auriel can now support up to 3 smart thermostats. Since the firmware update also added remote access through the Auriel app, you can use this to change your heating and cooling set points from any control interface whether you are at home or away. 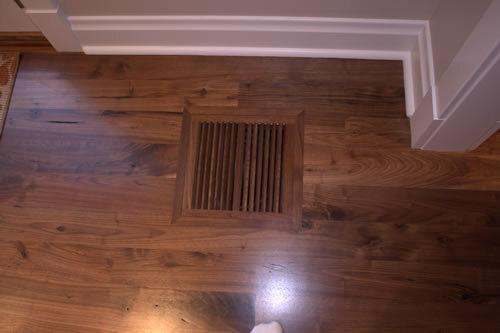 Adjust heat and cool set points manually, or use the built-in HVAC scheduler (pictured below). 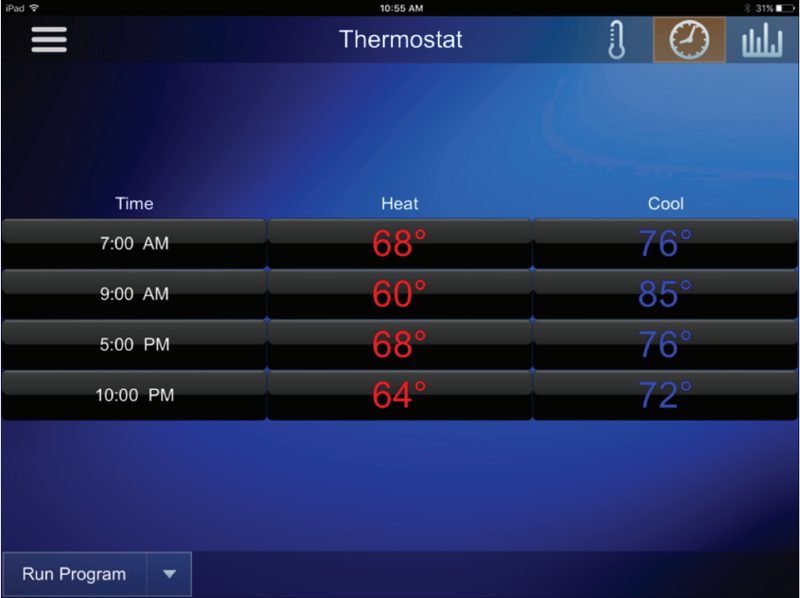 Supported thermostats include Aprilaire WiFi, Coolmaster IP, Radio RA2 (Touchpro) and select Z-Wave thermostats using the Veraedge Z-Wave gateway. 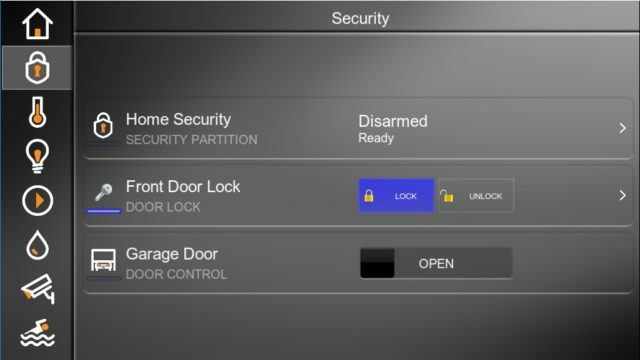 The firmware update also gives the Niles Auriel ability to control up to 24 third party lighting loads or scenes. 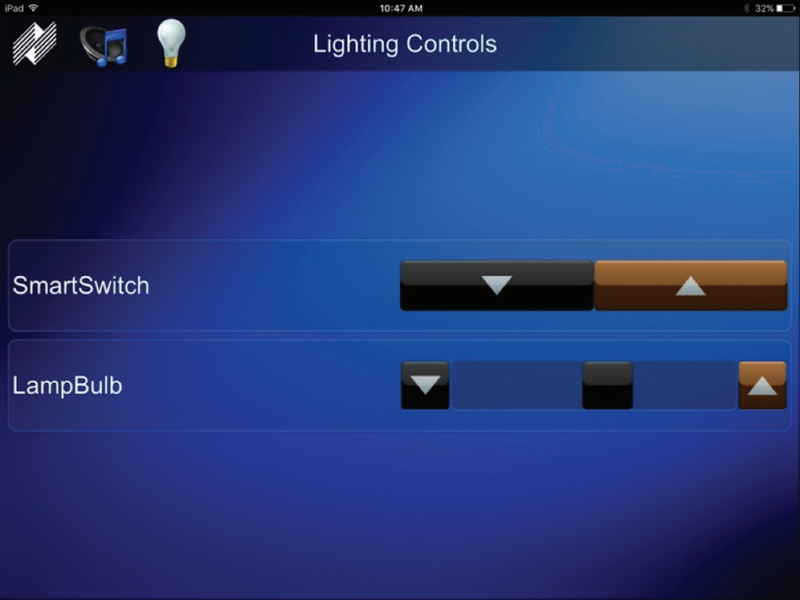 Control lighting loads and scenes from any control interface such as nTP7touchpanels, remotes, and the app. 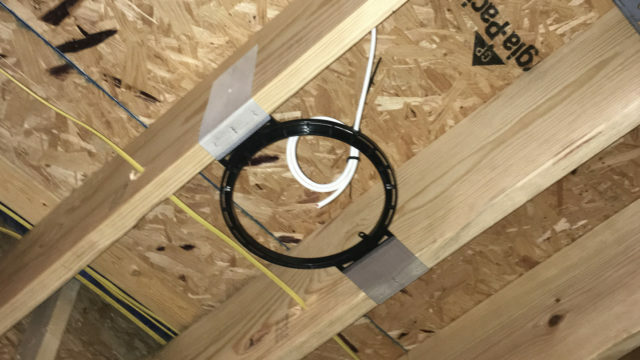 I recommend using Lutron Caseta or Radio RA2, but Clipsal, Rako, Pulseworx, and some Z-Wave lighting with the Veraedge gateway is also supported. Scheduling and automation is not supported by the Niles Auriel at the time of this post. The Niles Auriel is limited to integrating with one Home Theater Zone. It will only support one surround sound receiver. The surround sound receiver must also be controlled by IP and be within the list of compatible receivers. It also does not support more than 3 thermostats, and/or 24 lighting scenes/loads. Custom pages and button commands cannot be added within the control interfaces. The IR list and pages are preloaded into the system and cannot be edited. The Niles Auriel currently integrates with Integra, Onkyo, Denon, Marantz, and Pioneer AVR’s. The list is constantly growing so never be afraid to ask about your particular receiver. There is no RS-232 integration, so the model number within the listed brands must be capable of IP control. Typically this is found in the higher lines of equipment. If you outgrow the system by requiring more surround sound receivers, thermostats, or lighting loads, there’s no need to repurchase equipment. The Niles Auriel integrates perfectly into the Elan g! 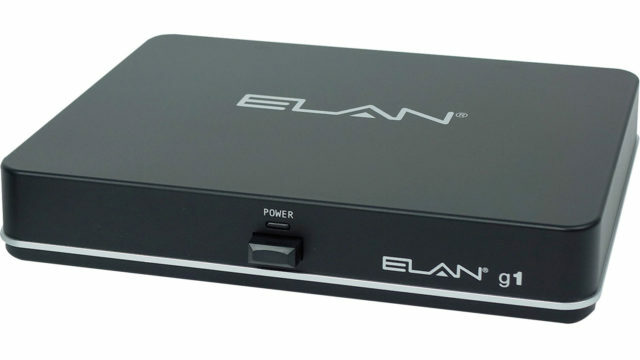 system, so by simply purchasing an Elan g1, gSC2, or gSC10 system controller the limitations are unlocked. Professional programming is required after this conversion, but we provide it nationally at a reasonable rate and there’s no need to purchase a new audio zone controller.